In the previous article, I discussed how our schools are funded, and hopefully was able to dispel some of the misconceptions folks have. This article address on the other side of the equation: Spending. Where does the money go? Treasurer Brian Wilson, in collaboration with Superintendent Dale McVey, periodically presents a Five Year Forecast to the School Board, as they are required to do by state law. You can find the current version here, on the District's website, where a number of other pieces of financial information are posted as well. It takes about 2 minutes of examination to understand that nearly all - 88% - of our operating funds are used to pay the salaries and benefits of our team of teachers, staff and administrators. Many people have assumed that I point this out because I think it's inappropriate. I don't. A school system is a professional services organization, and as such, will always spend the bulk of its money on people. I'll not rehash here the many articles I've written about teacher compensation (click on "teachers" in the topic list to the right if you are interested in reading them). For new readers, an article I wrote last year titled "Teacher Salary History" might be helpful in understanding how our teachers are compensated, and how that pay structure is defined. 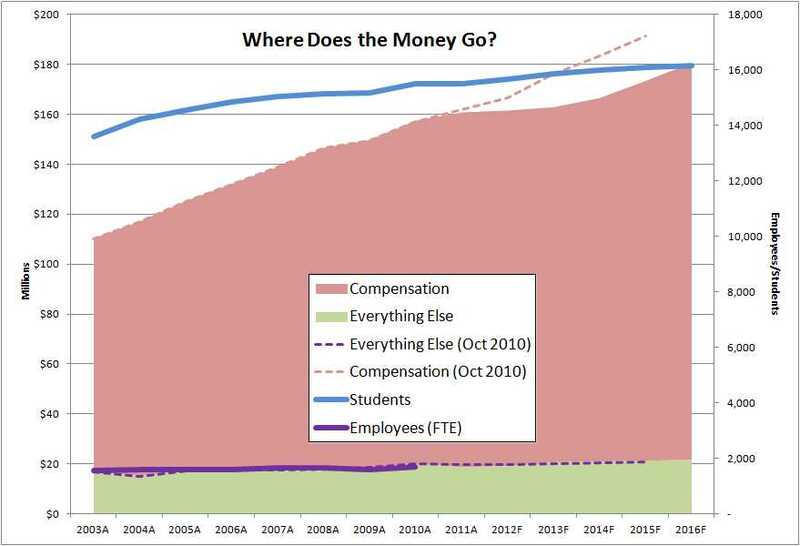 Please understand: the only reason I keep bringing up compensation and benefits is because it's the only component of our budget which changes much over time, as the chart above shows. There is a myriad of stuff that falls into the category "Everything Else," and certainly, we need to demand that our team does a great job of keeping those costs as low as possible. One way that happens is through efficient use of electricity, natural gas, and diesel fuel. You may have seen the announcement that our District received an incentive check of $112,000 from American Electric Power to reward us for a number of energy conservation projects which have been completed. As time goes on, I'm sure we'll find additional ways to save money on energy usage. You might be surprised to learn that the cost of paper textbooks is significant for our District, as it is all school districts. That's the reason there is so much interest in the potential of electronic textbooks, delivered on devices such as Apple's iPad or the Amazon Kindle. But we're not there yet. The publishers of scholastic textbooks still need to go through the same painful industry transition as has the music industry. Capital Records et al had to accept that they're in the 'music industry' not the 'record industry,' and that they would have to make their money by producing content people desire, and not via the manufacturing and distribution of plastic discs. The textbook guys need to do the same. Until they do, there is no money to be saved with electronic books, as the prices the publishers set for electronic editions remain close enough to the printed editions so as to leave no room to purchase and maintain the reader devices. We'll get there, but there are still many barriers to being able to save money via the use of electronic books. We spend a lot of money to run our school district - $160 million per year and growing. It's a little more than $11,000 per student per year. That's not some magic number. It's just what we have decided to spend. Some say we have to spend that much to maintain our rating of "Excellent with Distinction." I don't agree. The median spending for the 81 districts rated Excellent with Distinction in 2009 was $9,600, and it ranged from $7,200 (Bethel Tate/Clermont County) to $21,000 (Orange City/Cuyahoga County). Which one is the right number? We could spend a lot less in our District and still be Excellent with Distinction. But we would not be able to offer the richness of programs and services that we do. A district can be Excellent with Distinction without offering Chinese as a foreign language, or Pre-Engineering. Having well kept buildings and grounds is not a factor in our Excellent with Distinction rating. Nor is having exceptional extracurricular programming. These and many many others are all over-and-above programs we have locally decided to offer, and are a significant driver for our cost of operations. I'm not comfortable with the notion of an a la carte public school district. I believe that every opportunity we offer should be available to every student without regard to their economic status. I don't even like the fact that we charge academic fees, where even the elementary schoolers have to chip in for the cost of consumable supplies. It's just an unvoted additional tax, and a regressive one at that. But as we offer more and more variety of programming, each program serves a smaller part of the total student population. And not all programming costs the same. Offering Chinese means finding one qualified teacher, but there may be only 10 students in the class. Offering Ceramics means a qualified teacher plus a kiln and other equipment. A cross country team needs a coach or two and a path to run on. Football requires magnitudes more than that, but also generates substantial income. Maybe an a la carte system is the way we have to go. We can't keep asking every taxpayer to fund every program. Maybe we have come to the point where our public school system is just too expensive given the resources and demographics of our community, and we need to think about a different way of organizing and funding all these things that we do. That's not going to be an easy conversation. But it needs to be had.